With one of the city’s typical downpours dousing spirits on this year’s de facto Bonfire Night, it’s down to Atlanta quintet, Manchester Orchestra, to raise them again inside the famous Ardwick theatre. Squeezed tightly to the front of the stage by an enormous black curtain, birthday boy frontman, Andy Hull and co. hold court with their crunchy, yet deliberately paced indie-rock, which recalls Wintersleep in their snappier moments (‘I’ve Got Friends’, ‘Shake It Out’) and Midlake when the tempo drops to a crawl (as on a drastically reworked ‘Everything To Nothing’). Keyboardist/occasional drummer, Chris Freeman, is the real star of the show, though, bobbing his head maniacally through the set’s more dramatic moments like a parrot during an elaborate mating dance, as well as playing air guitar and air drums simultaneously. He’s in his favourite band, and it certainly shows. 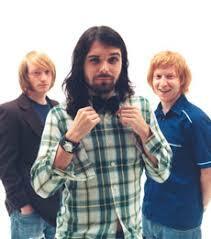 Biffy Clyro have become popular in the old fashioned way. Rather than, as is so often the case, being caught in a sudden explosion of unsustainable adoration before their first album even hits the shelves (La Roux, White Lies and Florence & The Machine, I’m looking directly at you – although it’s not your fault, admittedly), the Scottish trio have stepped up in venue size with each of their five albums so far, culminating in this sold out performance. The band stand primed in front of an elaborate backdrop which looks like a cross between Tron and the pulsating insides of a stereo’s LCD display, Simon Neil’s white shirt sodden by time ‘Living Is A Problem Because Everything Dies’ – the song which propelled them from inventive underdogs into rock’s big league in ’07 – drops out of earshot. He holds his guitar bayonet-like, dragging out the skewed riffs of ‘Who’s Got A Match?’, ‘Glitter And Trauma’ and the psychotic ‘There’s No Such Thing As A Jaggy Snake’ with an intensity unrivalled this side of Frank Carter, a fleet of mobile phones floating on a sea of raised hands fighting to capture every last moment. Although they sail dangerously close to self-parody when a single lightbulb hangs above the frontman’s head during the otherwise tender ‘Machines’, sheer apoplexy is reached when ’57’ from their ‘Blackened Sky’ début is tossed out to devastating effect. Biffy are living proof that music might be meritocratic, and that the kids who pop today will rock tomorrow after all.